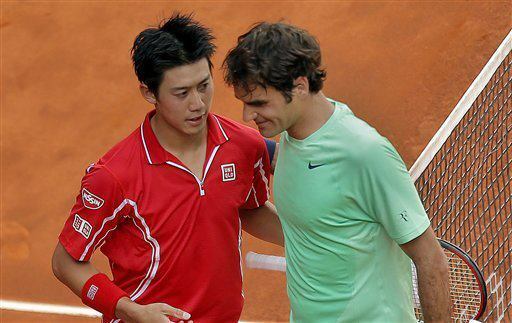 Kei Nishikori upset second seeded Roger Federer Thursday at the Mutua Madrid Open. The Swiss maestro was error prone, hitting 31 unforced errors in the three set loss, 6-4 1-6 6-2 to the 23 year old Nishikori. A slow start by the Swiss lead to an early break for Nishikori, who would go on to serve out the first set. Federer bounced back, breaking early in the second set after numerous chances. He would cruise to evening out the match, only to show signs of rust in the early parts of the final set. From there, Nishikori held strong, growing in confidence when he was able to hold serve for 5-2. The errors kept piling on for Federer, who dumped one final forehand on the run into the net, giving Nishikori his first ever win over the Swiss maestro. The loss is Federer’s earliest defeat in 10 years at the Madrid masters, spanning its days on clay and previously on hard court. Next on schedule is the Rome masters. Main draw play begins Monday, May 13. After the match, Federer addressed his disappointment in the loss and said he would be straight back on the practice court to find rhythm he was lacking. “I feel like I want to go to the practice courts this afternoon, but clearly I’m not going to do that. I’m going to make sure I’m as well prepared as I can be for Rome. I’m excited for that, because clearly I have no choice but to hit the practice courts. And I like to do that, and I’ll do that well and hard,” said Federer, who goes to the Internazionali BNL d’Italia searching for his first title of the season.